Founded in1976, Breedendam shipyard has built up an excellent name in the construction of traditional luxury sloops. 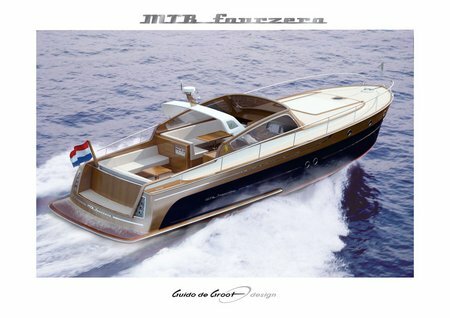 In addition to such sloops, BreedendamYachts focuses on the construction of the Breedendam MTB, a beautifully lined retro style tender itha design basedon the MotorTorpedoBoat from WorldWarII. 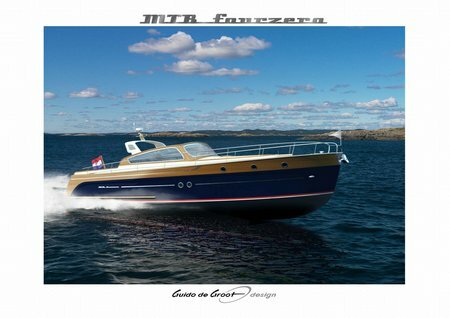 The shipyard has already built several MTB30s and MTB33s and because of the success of the MTBs, it was decided last year to renew the MTB line, outfitting the yachts with the latest technologies and with the interior and exterior design by Guido deGroot Design. The fabulous four zero. The MTB four zero is built entirely of aluminium, which gives her a very strong construction and a weight of just 12.6tonnes. With an LOA of 13.37 metres and a beam of 4.00 metres, the spacious cockpit can accommodate lots of guests. The yacht has been equipped with the IPS system from Volvo, which ensures optimal comfort and easy mooring. With two IPS600 engines of 435 hp each, the Breedendam MTB four zero has an impressive performance and top speeds of up to 38 knots. The yacht’s lines are timeless. Characteristic features of the MotorTorpedo Boat are its pointed bow and wide stern, which has virtually the same beam as amidships. The hull is available in various colours that is supplemented by a contrast colour with a ‘woodlook’ finish. The windows, also with a ‘woodlook’, make the exterior very maintenance-­-friendly. A robust stainlesss tee lbumper marked with the name ‘fourzero’ is fitted on the hull, while the cap rail is finished in solid teak in a high gloss varnish to enhance the yacht’s deluxe appearance. The spacious interior is finished in teak. The headroom of no less than 2.00 metres is exceptional for a boat of this kind, and the galley offers all the comforts you would expect in a luxury yacht, including a refrigerator, a twin burner stove, a combioven and a dishwasher. Across from the galley is large L-shaped sofa finished in leather. The fore cabin has a large double bed with ergonomic mattress for maximum sleeping comfort, while the head and shower are separate so they can be used individually. A nice design touch is the ‘fourzero’ logo on the mirrored wall in the fore cabin. The steering position and cockpit have spacious so fas and leatherpadding. The yacht is also equipped with high-quality navigation equipment as well as a next ensive multimedia system. The total electric system uses a CanBus system, and all onboard equipment, including multimedia, can be controlled via an iPad.